Whether you are wanting to explore nature, enjoy animals, or just want to help out locally, Octagon Wildlife Sanctuary is the place to go. Octagon Wildlife Sanctuary is located in Punta Gorda, Florida right across from the solar-powered town of Babcock Ranch. The pricing for admission is quite reasonable and all proceeds go to the sanctuary, it typically takes the average visitor about an hour and a half to look at all the animals and learn about them, so you certainly get your money’s worth. Octagon Wildlife Sanctuary is a place where they take in animals that were abused or held in captivity, they rescue these animals and help them live wonderful lives. The animals will live at the sanctuary for the rest of their lives, and in addition, the sanctuary is a great place to bring your family to and have a day of fun learning about all the different animals and their unique stories. All the people that work there are unpaid, as they are all much needed volunteers that help out, yet accept donations to help with costs associated with helping the animals. There are picnic tables to sit at and enjoy nature and look at the animals, and you can also have a picnic, you can bring food and enjoy it on a beautiful day in nature. Every animal has a sign that tells you their story and you can learn a good amount about all of the unique animals. 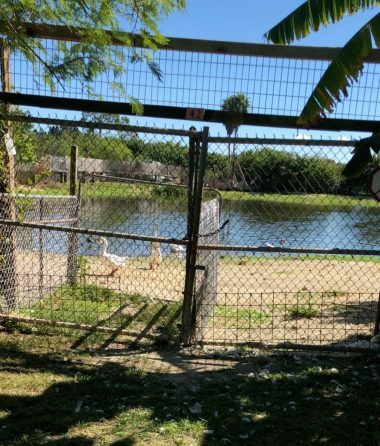 The sanctuary is a self guided tour and you can follow the path or take your own path to look at all the animals and learn some information you may not know, and there are many cool stories to hear about. Whether you are volunteering or just enjoying your day, the Octagon Wildlife Sanctuary is not only a fun place to go, but it is also educational. You learn a lot, and overall it is a great place to bring kids. Octagon Wildlife Sanctuary is a place for everyone of all ages to come enjoy a relaxing day and have fun! For more information on excellent Punta Gorda living, please contact Your Suncoasteam.